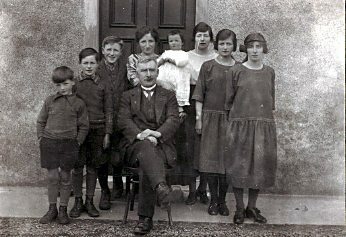 Cromarty Image Library - Couper family - c1923? Family including parents - Isabella (mother) used to teach at Cromarty School. Name of People Left to right starting with the boys; Ronald, Willie, Walter. Baby's Name is Helen, The last two girls are Chrissie, Rhona. Dont Know the third girls name, or the fathers name. Third girl is Annie and her father is James Methuen Couper. Annie, like many of her relations, is buried on the hill. She died far too young. I'm told she was a great character, very like her mother.